If you are seeking strengthening exercises that will also help you develop balance, try these variations on the classic lunge: lunge step ups, overhead dumbbell lunges, and tiptoe walking lunges. All three can be included in a gym or home training routine as they require little more than an adjustable step and some light hand weights. All three exercises focus on the entire leg, including quadriceps and hip flexors of the back leg, hamstrings and gluteals of the forward leg, and abductors and adductors for stabilization. They also engage the abdominals, obliques, and lower back muscles. The overhead dumbbell lunge is also effective in providing some isometric training for the muscles of the shoulders and arms. To perform this variation, stand a natural stride distance away from and facing a 6-18” high step with your hands on your hips or holding dumbbells at your thighs. Start with body weight only for 6-8 repetitions per side until you master form. Stride forward with the working leg so that your entire foot lands squarely on top of the step, then in a smooth motion lift onto the step until torso is vertical without touching the trailing leg on the step, maintaining balance throughout the repetition. Reverse the movement, returning to the low lunge position before pushing back into starting position with both feet on the floor. Step softly and quietly so the muscles remain fully engaged; do not let gravity drop you down to the floor; maintain control throughout. If you have trouble with balance going from the lunge to the step up, touch the trail leg to the step briefly until your strength and balance have improved, reduce the load, or lower the step height. Perform with a barbell across the back of your shoulders, dumbbells in each hand, or wear a pack or weight vest to increase intensity. Repeat for the desired number of repetitions before switching legs. Hold a light dumbbell in each hand and extend your arms up overhead, palms forward or facing each other, whichever position is most comfortable for you. Stand with your feet parallel and shoulder-width apart. Take a natural stride forward with one foot. Keep your torso vertical, your shoulders directly over your hips, and lower your body until your knee is an inch above the floor. Exhale and press up through the heels to activate the gluteals. Return to standing. If it feels awkward maintaining the extended arm position overhead while shifting your body position forward, try a static dip (some refer to this as a split squat) which does not require a stride forward or back. If you feel discomfort in the forward knee, minimize the distance it moves forward over the foot. If you have difficulty keeping your balance, make sure your forward stride is not too narrow; your foot should be placed in front of where the hip was when you were standing rather than in front of the other foot. If you have trouble keeping the dumbbells overhead, try the movement with a light dowel; the longer implement may provide enough stability to help you develop core strength and shoulder endurance to eventually move back to dumbbells. To perform a walking lunge, start as if you will be performing the dumbbell lunge (above) but with dumbbells held down by your sides instead. The walking lunge links together 6 to 12 strides, keeping the torso vertical and continuing along a straight line such as a hallway. 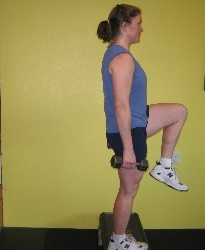 To challenge your balance and increase recruitment of the calf muscles, do this variation on tiptoes. Include this version unweighted as part of a dynamic warmup routine, or add the tiptoe walking lunge while going uphill.